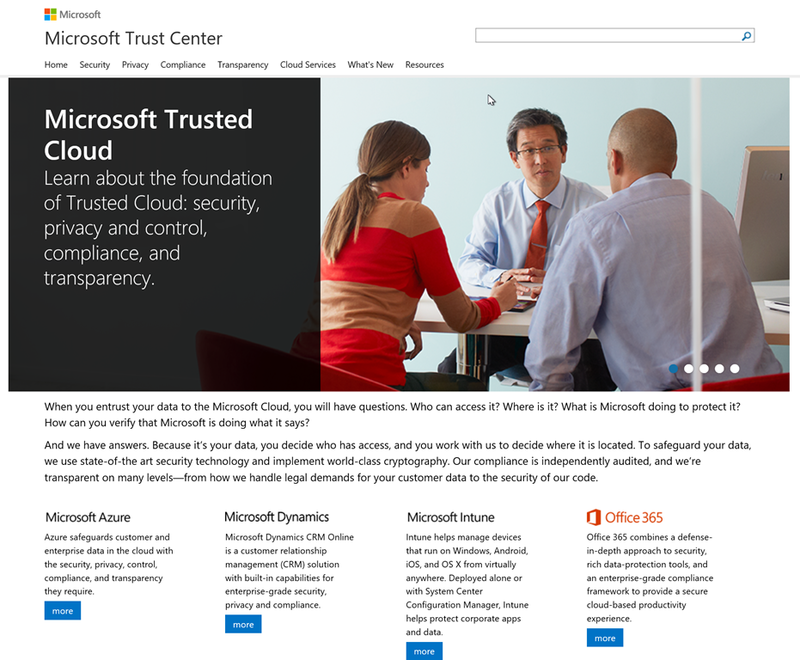 Today we’re pleased to announce that we have created a single Microsoft Trust Center at www.microsoft.com/trustcenter, which unifies the trust centers of our enterprise cloud services—Microsoft Azure, Microsoft Dynamics CRM Online, Microsoft Intune, and Microsoft Office 365. The Microsoft Trust Center gives everyone a single view into the commitments that we put at the heart of our trusted cloud: security of operations, data protection and privacy, compliance with local requirements, and transparency in how we do business. Now, customers can view a single page documenting which of our services comply with such standards as ISO 27018 or HIPAA, or our data location policies across services. It should be noted that no other cloud service provider has the depth & coverage of Microsoft in the areas of security, privacy, compliance & transparency for attestations, evaluations, & reporting.